THE NORTH VANCOUVER QUEST IS READY TO SERVE! SPREAD THE WORD: QUEST IS HERE! Find us at 167 East 1st Street. The main entrance is via the laneway. Tel: 604-566-0110. Operating hours: Monday-Saturday 9AM-4:15PM. Great news for our Quest Food Exchange clients and partners, our new Grocery Market location in North Vancouver opened on January 30th! This is our fifth location and will provide a dignified shopping experience. Like our other Not-For-Profit Grocery Markets, a variety of fresh, frozen, and non-perishables are available at a significantly reduced cost. For less than $5, you can pick up organic tortillas, a pound of beans, 3 mangoes, 4 cucumbers, 4 bell peppers, potatoes, lettuce, and green onions! Quest staff member, Kelly, assists Quest client, Laura, as she picked up more than what she may have bargained for! Approach your caseworker, school counsellor, medical clinic, community resource, or one of Quest’s partnered agencies and ask them to complete a Client Referral Form on your behalf. You may then attend our market location, present identification and obtain your card, which is valid for three years. You may also shop at any of our grocery markets. Not sure if you qualify or have any questions? Contact 604-602-0186 Ext: 109. Sue Irwin and Christine Mann of ‘the North Shore Community Resources Society‘ were on site to find what Quest has to offer. Mission accomplished! The NSCR partners with over 600 agencies in North Vancouver and can assist you in obtaining a letter of referral ! -Lynne Henshaw, North Shore Homelessness Taskforce. Benjamin helped paint this large mural of the Burnaby Carousel, along with other artists at My Artist’s Corner which is an art-based program associated with CMHA Echo Burnaby, one of the over 400 social service agency partners of Quest. My first contact with Quest Food Exchange was when one of the community outreach speakers came to the CMHA Burnaby location to explain how the exchange works and invite us to join. The concept is simple and very powerful to those of us on a limited food budget. Donated foods nearing the end of their shelf life are safely available at very reasonable prices in a shopping style store. We can choose the foods that we want and our food dollars go much farther. We are buying our own food, which promotes our self-respect. There is also the opportunity to volunteer in a variety of ways to help keep the wheels turning: warehouse distribution, shelf stocking and office duties to name a few. Volunteering is a great way to help Quest operations, join in community participation and gain work experience. For those of us who are currently unemployed, food is a large part of our budget, after housing. Quest is an incredible resource that helps us stretch our food dollar with a variety of wholesome foods. We are very fortunate to live in a society that is so bountiful in food resources. We are even more fortunate that there is an organization like Quest that is able to both provide food resources to those in need and at the same time save food that might otherwise end up being wasted and thrown away. There is a strong need for a food exchange that empowers individuals in need to be able to stretch their food dollar and choose their foods in a shopping style environment. Kudos to the Quest Food Exchange for providing this much-needed access to affordable food! Circle K International is the largest collegiate service organization in the world. As the collegiate affiliate of Kiwanis International, Circle K is present on over 500 university campuses around the globe, and spread out over 17 different countries worldwide. Collectively, its members perform tens of thousands of service hours annually, benefiting their campuses, communities, and a number of other charities. With the motto, “live to serve, love to serve,” they aim to make the world a better place, one act of service at a time. Each year, Circle K International holds a Large Scale Service Project (LSSP) and International Convention (ICON) in a city around the globe. In recent years, this event has taken place in New Orleans, Virginia Beach and St. Louis in the United States. This year, Circle K International has transcended international borders to host its 13th Annual LSSP and ICON in Vancouver, BC, Canada. LSSP is an opportunity for members to give back to the host city of their convention. Circle K International has about 150 members from Canada and the United States working together across the city in edible gardens, shelters, and constructing playgrounds for two local area schools. One group of these members was able to go to Quest – an organization dedicated to providing healthy and affordable groceries to individuals and families, and is largely run by volunteer efforts. On June 24, 2013, 10 members of Circle K International arrived at Quest, unsure of what the day would bring. After listening to a brief presentation about what Quest has accomplished and how they operate, the members quickly got to work, volunteering to assist with composting, repackaging food, and stocking the market shelves. Hava Goldstein composting at Quest. “It’s been a lot of fun. I really liked learning about Quest. I like their idea of making it less stressful and embarrassing to get food. I like the way they stray away from making [getting food] a disheartening process for some families,” Florida District Circle K member Hava Goldstein said. Goldstein worked with composting at Quest. Composting is a key attribute of Quest’s mission to foster sustainability. In composting, members separated rice from plastic bags to ensure that the plastic would not be thrown away, later ending up in landfills. Composting and separating food from its original containers are two great ways that Quest benefits the environment. In the Distribution centre, a few Circle K members worked with the repackaging section. Most food comes to Quest in large quantities from local grocery stores that are not the optimal size to place on shelves. Fresh fruits and vegetables, salmon, and crackers are a few items that are donated often. Quest also receives a number of bakery items on a daily basis. Clara Oh and Kat Graves repackaging food. “Food is the most essential necessity, and I’m glad that we’re able to help out,” New York District Circle K member Kat Graves said. Circle K members worked to create labels and weigh bags of flax corn chips- to be appropriately sized for purchase. Because so much of the food comes to Quest in bulk, it is important that they have volunteers to sort it, in order to keep their shelves stocked for the families that shop there. “In my home club, we do a lot of volunteering in food banks and soup kitchens. It is very meaningful to be able to do the same thing in Vancouver while we are here for LSSP,” New England District Circle K member Will Bradford said. Though members of Circle K International have interacted with a variety of food banks and soup kitchens in their own communities, one member found Quest’s mission to stand out from the rest. “I like how Quest is different from a traditional food bank. We aren’t just sorting cans and giving people boxes of food. People can actually choose what they want and have a say in the food they bring home to their families,” Missouri-Arkansas District Circle K member Clara Oh said. The area of Quest that has the most interaction is the Not-For-Profit Grocery Market itself. Members from Circle K worked to shelve food, collapse boxes, restock produce, clean the market and organize products. During Circle K’s visit, members were even fortunate enough to see their efforts benefit families that came in to shop while they worked. “I think it’s really inspiring that this program exists for people in need. Quest assists the people in a number of ways, by getting the community to not only donate money, but also food. Quest is a great opportunity for individuals seeking volunteer experiences and for the families that also need additional assistance,” says Texas-Oklahoma District Circle K member Allison Prisco. Circle K members really enjoyed working with Quest during their first day of LSSP. Not only does it have a great sense of community, filled with hard-working staff, but it also mirrors some of the principles that Kiwanis upholds. Kiwanis is a global organization of volunteers dedicated to changing the world, one child and one community at a time. Cody Schara helping out in Quest’s not-for-profit grocery market. “Quest is helping communities, one family at a time, which is similar to Kiwanis’s mission statement. Working with them today shows how closely our missions parallel, and it was a great opportunity to be a part of that,” Wisconsin-Upper Michigan District Circle K member Cody Schara said. Working with Quest was a great opportunity for Circle K members to see the difference they were making in Vancouver. As it was many of the members’ first visit to the city, being able to work in a venue where so much service toward the community is taking place made for a very memorable experience. Circle K International is proud that they were able to help Quest today! We appreciate Jeremie’s efforts at Quest, and for taking the time to provide us with this feedback. I find it incredible what Quest Food Exchange is doing and wholeheartedly support it. What really clicked with me is how Quest is being efficient with what our society has, and not being wasteful. To go beyond that and to be redistributing this food to people who can really benefit from quality food at a reduced price is something we can all stand for. When I think of all the efforts, costs, and environmental impacts of growing and transporting our food, and then think of it going to waste, it’s shocking. It frustrates and saddens me, it’s a real shame. It feels fantastic to be working for an organization that touches on so many social practices that I believe in, whether it is sustainability through proper composting and recycling, or the value of reallocating healthy foods that nourish people from all walks of life. Finally, by giving opportunities to people seeking practical work experience increases their self-esteem and helps them get back into the job market; thus building community. Not only are individuals being provided with food, but also helping to reduce the amount of loss and waste from various branches of the food supply chain. For example, I learned that many of our suppliers simply need to make room for new orders. Instead of throwing it out they donate it to us. Students from the University of Utah Choose Quest! On March 15, 2012, a group of dedicated students from the University of Utah attended Quest as part of their week long Canadian tour. Dr. Keri Schwab of the University’s Parks, Recreation, and Tourism Department, together with her colleague Rose Zagal, a nursing and anthropology student organized a trip to Vancouver for their group of twelve, as part of their 2012 Alternative Spring Break trip. The objective of their trip was to participate in a program in which University students chose to spend their spring break traveling to either a local or international city and perform community services focused on specific environmental or social justice issues. The trip to Vancouver focused on the issues of health care and poverty. In seeking opportunities, the students were really impressed by Quest’s community based mandates. As Ms. Zagal plans on getting her Masters in Public Health, she believes strongly in preventive health care. Therefore, she carries a mindset that the World as a whole can utilize improvements to health and social betterment. She saw Quest as a great example of this trend. 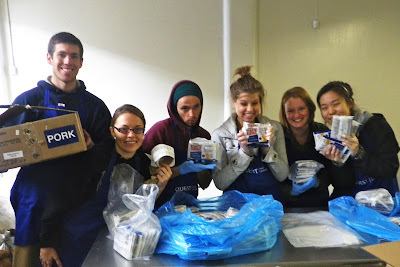 The day the students came, they spent the entire day in our not-for-profit grocery market and community kitchen. According to Distribution Manager Ken March, they were eager, efficient and incredibly fast at repackaging the required items. We thank this group immensely, not just for the work you did, but for choosing Quest as your organization, and Vancouver BC as your destination. We look forward to seeing you again!